While overwhelming clutter is no reason to laugh, you have to have a sense of humor to deal with it! I’ve had many an organizing session that started with tears and ended with laughter. While most people don’t find organizing fun, or even remotely amusing, I do! This is partly why I do what I do and what I try to bring to the organizing experience with clients. Picture it: We are sitting on your floor going through a box of random stuff. Tedious, right? Not necessarily. Inevitably, there’s something unexpected in the box. Sometimes it’s finger puppets, sometimes it’s brass knuckles, and sometimes it’s a rubber ducky. Regardless of the item, it always illicit a “where’d this come from?” remark from the client, followed closely by a laugh. Many people approach organizing with a lot of anxiety, especially if they’ve never done it before. That’s natural. Organizing and going through things that you haven’t seen in a long time, is anxiety-producing by nature. All sorts of unresolved insecurities and memories associated with your stuff tend to come up. Since you haven’t been successful at dealing with the clutter, you’re not sure how a stranger could help you. While we can’t (and shouldn’t) just laugh those away, using humor to mitigate some of those issues can ease the anxiety of the entire process. 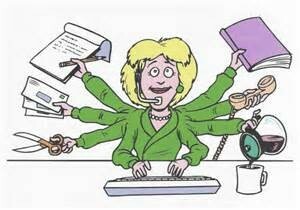 A good Professional Organizer bring many skills to the job, and a great Organizer gets you laughing in the process! I had a client, early on, who would get very easily distracted. To lighten the mood we decided to call it ‘seeing a chicken’. I’m not sure why a chicken, but it worked. Every time she would drift off from the task at hand, I would yell “CHICKEN!” which always made both of us laugh and brought the attention back to where it needed to be. While you might not think that organizing can be fun (like I do), it’s definitely doesn’t have to be painful. I’ve recently acquired a plastic microphone that plays “Let It Go” from frozen, just in case someone needs a little extra motivation (and laugh) to part with clutter. As they say “I little knowledge is a dangerous thing”! We read a book or see a video and all of a sudden we can fix anything! But more often than not, we end up making a bigger mess than we started with. I get asked, daily about my thoughts on Marie Kondo’s Book “The Life-Changing Magic of Tidying Up”. Clients often mention they’ve read it, non-organizers ask what I think of it and other organizers roll their eyes when they talk about it. This post won’t be about the book, as it seems to be getting enough press on its own, but rather to talk about what it signifies for people. Many people believe this book is some sort of secret weapon against clutter. They think that just by reading it, they will make their clutter disappear and be able to live a happily organized life forever more. I mean, it’s right there in the title…”magic”. 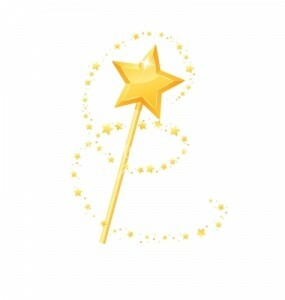 The problem is that there is no magic wand that will get rid of clutter. If there was, I certainly would have gotten one to help my clients. But just like anything that people struggle with (weight, career satisfaction, happiness), one has to put in the time and effort to achieve what one wants. Our get-rich-quick society of diet pills and instant meals has made us expect that there’s an easy fix out there somewhere for everything we need, and it’s just a matter of Googling it. Unfortunately, that’s just not the case. And in each and every situation of trying to accomplish something without putting in the proper work, there is inevitable failure and disappointment. That’s how I see this ‘new’ organizing method. Mostly, it isn’t new. The ideas have been around for a long time, used by all organizers. It’s just the marketing and packaging that are new. Every client that has read it, has told me that they got very excited and did what it said to do, but it didn’t work for them. And each time I have to explain why it didn’t work. Here’s what I tell them…The book was written from a cultural perspective different than the one we have in the US. In the US, we are of the mentality that ‘bigger is better’ and ‘more is preferable to less’. For right or wrong, that’s just the way it is. While minimalism is a lofty buzz word goal, it is not the norm. Unless you’re living in New York City, you usually have some space to play with. 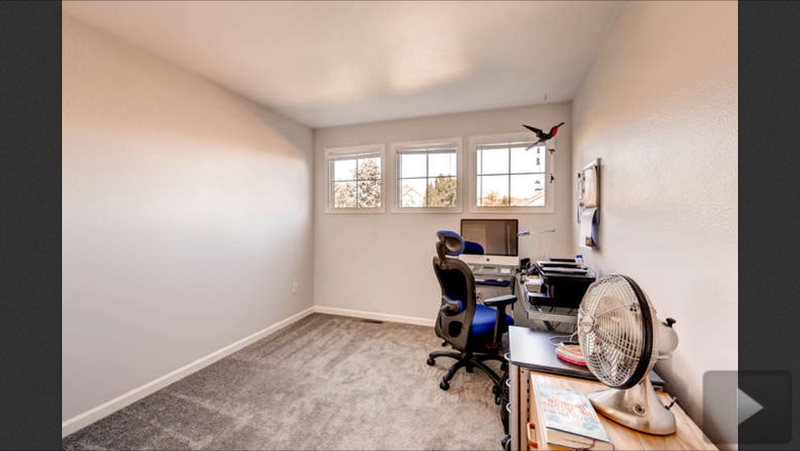 Space leads to acquiring things, which often leads to clutter, which then leads to feeling overwhelmed, which then leads to trying to find a way to stop feeling that way without actually getting rid of the stuff, which leads to self-help books. Sound familiar? Unless we all plan to move to Japan (or NYC), where space is limited, we will have to find a method that works for where and who we are. While the idea of keeping what “sparks joy” is a great one, this will only help in narrowing down your sweater collection or bookshelf clutter. In my work, I have found that is only a fraction of the clutter in most American homes. What’s to be the fate of the things that don’t spark joy but need to be kept anyway, like tax documents (for 7 years), trash bags, batteries, plungers, etc.? A lot of what we keep is necessary for day to day life. So this is where the topic of knowledge comes into play. Since there is no magic answer, we need to find out what is and is not right for us, organizationally speaking. It’s not just about letting go of things, we need a way to be able to hold onto the things we want and need without letting those things overwhelm our space and our mind. That knowledge will help us far more than a one-size-fits-all self-help book. Let me say that there is absolutely nothing wrong with self-help, but if we could all heal ourselves by reading books there would be no need for doctors, or psychologists or organizers. 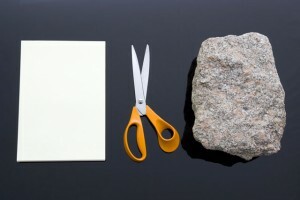 Know that there is no ‘quick fix’ to organizing (or anything else in life)! Knowledge is power, and power needs structure! As the saying goes, “One man’s junk, is another man’s treasure”. I think that was said by Sanford and Son. Clients often worry about getting rid of things because they don’t want to throw away something they’ve spent money on. I hate to throw away useful things! This is why I like to donate as much as I can to worthy organizations such as Goodwill. I tell my clients that even though they can’t use something, someone else may be able to use it. You may not need or want the Elvis clock your great aunt Trudy gave you for your birthday 3 years ago, but someone may find it at Goodwill and feel like they’ve hit the jackpot! Everyone thinks their things are worth a lot of money, and therefore hate to get rid of them. But when is junk, really just junk? I say. It’s when the cost of keeping something outweighs the cost of letting it go, or trying to sell it. The cost of an item is not just monetary, things cost us energy (in upkeep), time (in trying to sell them) and emotional distress (in keeping too much). In past blogs I’ve discussed the idea that our stuff takes a toll on our emotional health and can often make us feel overwhelmed and unfocused. Likewise, we can get so bogged down with maintaining our junk that we forget that it’s there to serve us, not the other way around. Clients often tell me they have things they think are ‘worth something’, and are eager to sell them. It’s difficult telling someone that no one is going to pay big bucks for their old toaster or college textbooks from 1978. People also always want to sell clothing and ask me about consignment shops. I’m not a fan of consignment, since they only take items in pristine (and dry cleaned) condition, that are currently in style. Most people seem to want to consign old, worn out clothing from their teen years. Unfortunately, I often have to burst the get-rich-quick bubble by saying most people’s junk is just that, junk. I tell clients that the time and money (if you hire someone) you will spend trying to sell something is worth more than the item. 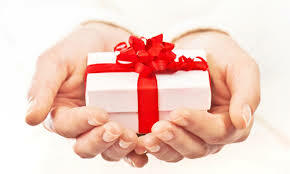 More often than not, the tax write-off you will get from donating it is a much better and less stressful option. If you do choose to take the time to sell your things, a few good spots are Craigslist (for local items), Ebay (for collectors items), Thread Up (for clothing), Rebagg (for purses). So what if your junk doesn’t fit into a box you can throw into the back of your car and drop off at the donation center? I tell my clients that I will take away and donate everything that fits in my car at the end of each work session. I’ve had clients take me up on that, literally, so that that I leave their home with only enough room for me to fit into the driver’s seat. For those that have bravely tackled a garage-full of junk, there is help in the form of junk haulers. This is an amazing business, which complements the work that we, organizers, do. For a nominal fee, they come to your home with a big truck and muscled employees to remove everything you want gone. The best part is, that they don’t just take all of it to the city dump. Companies like Junk King, make sure everything they haul away is dealt with responsibly. They do everything from recycling old refrigerators to donating your bedroom set. Companies like Gone For Good even have a store where they give you a discount on your haul-away of they can resell some of your old items. Then there’s Clutter Trucker, who specializes in hoarding situations and mandatory clean-outs. What’s the point? I’m glad you asked! Whether you think of your stuff as junk or treasure, if you don’t need or want it, don’t hold onto it! Your Junk may be useless to you, but useful to someone else – Donate it! Is your junk ‘worth something’? – Sell it! 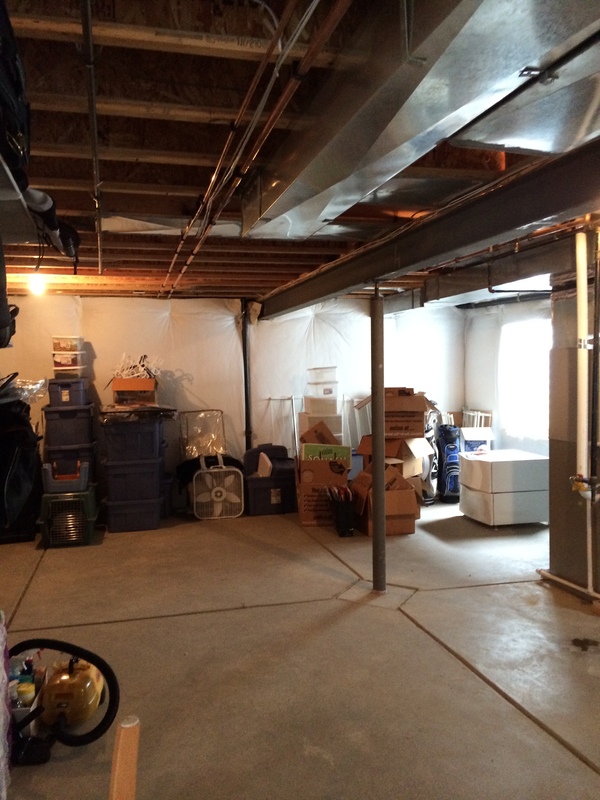 If your junk is overwhelming your space and you – Have it hauled away! Technology is the wave of the future, but sometimes this wave is so powerful that it’s easy to feel like you’re drowning in the sea of information. Emails, blogs, newsletters, TV, mail, Facebook, Twitter. – all these different things bombard you with information on a daily, and sometimes hourly basis. Having a computer is a must these days. It’s necessary for work, and most students (even as early as elementary school) are required to have one. You can find out just about any information you want from a computer. You can pick were to eat, where to go on vacation, buy a car, make new friends, electronically stalk someone, and meet your future spouse. Computer’s are amazing! I could not have written this blog without one. However, they are also the cause of a LOT of stress. These magnificent machines can certainly cause problems – that spouse you met online is now ‘chatting’ with someone else, your bank account has been hacked, your directions sent you to an abandoned warehouse instead of the fabulous new restaurant you were going to, your vacation confirmation got lost and you are now stuck at the flea dip motel, next door to the Scranton, PA thumb wrestling team on their way to regional’s. The mail also keeps coming, no matter where you move or how hard you try to run from it! And, unfortunately, in this computer age, it doesn’t all consist of love letters and postcards from fun far-away places. It’s mostly junk and bills! So the choices to combat the information overload are to move to a cave with no Wifi, where even the bravest of mail carriers does not dare to tread, or learn to manage it, so it doesn’t manage you! Luckily, I’ve got some tips to help with the latter! Mail – When the mail comes, spend 10 minutes sorting it right then and there! 2. File – can be put aside (like in a small basket marked ‘to be filed’) and those items can be filed, on a weekly or even monthly basis, depending on the amount. 3. Action (anything you need to do something else with) – can be further sorted into individual categories like pay, read, respond, etc. This really should only take 10 minutes, unless you are a very important person who receives tons of mail daily (like the President or Justin Bieber). Each category in your action pile should then be followed up on to complete the actions. This way you don’t need to dig your bills out of a stack of pizza menus and credit card applications, and your lights won’t get shut off for failure to pay the bill because you didn’t know where it was! Also, a way to have less unwanted mail is to sign up with a service like DMAchoice. They help you decrease the amount of direct marketing you receive, so you have less junk to wade through and throw away. Email – I get at least 50 emails daily…45 of which are things I don’t need to look at. To start getting less of those, each time an email comes in that you don’t want, take a second to go to the bottom and hit the ‘unsubscribe’ button. You may have to do this for a lot of emails, but it will be worth it when your inbox is no longer cluttered with ways to decrease your debt and increase your hair line. Also, the same principle applies to email as paper mail. Take ten minutes to sort it. Set up email folders like, “Upcoming Events”, “Read/Review”, and “Follow up”. When emails come in either, 1. Delete them, 2. File them, 3. Act on them. This way your inbox won’t build up like soap scum in your bath tub, getting to the point where it’s just gross! The bottom line is that it’s manageable if you manage it in little bits, before it gets out of hand and causes a breakdown (electronic or literal). Go through your mail immediately! Unsubscribe to junk emails as soon as you get them! Set up folders in your inbox to sort keeper emails! When people learn that I’m a Professional Organizer, they associate it with the show “Hoarders” (which, by the way, I cannot watch at all). They often ask if I work with “Hoarders”. The short answer is…Not really. 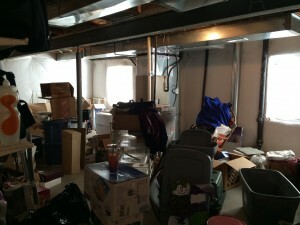 The longer explanation is that there are 1-5 levels on the Clutter Hoarding Scale. I have worked with levels 1-3, but levels 4 and 5 are best left to those with a background in psychology, because true Hoarding is a psychological disorder. 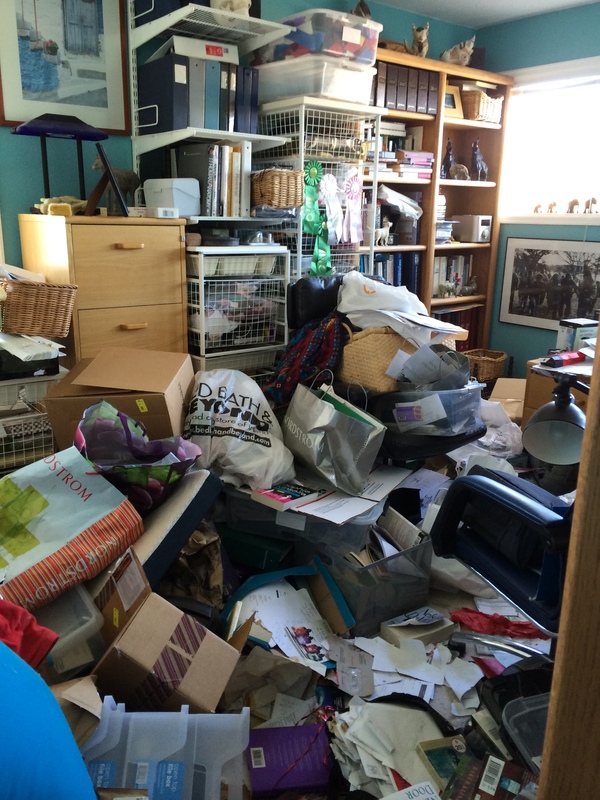 The word ‘Hoarder’ is thrown around lightly, these days, partly because of the show and party because it’s become a buzz word for anyone who has too much stuff. Many people will tell me that they have so much stuff they’re “practically a hoarder”. Others will smile and say they’re on their way to becoming one, and still others will say they have some clutter, but can’t be “classified as a hoarder”. There is a distinct line between people who are messy/cluttered and those who hoard. That line is defined by a person’s ability to function. Can they cook a meal on the stove, or are there stacks of mail on it? Can they take a shower, or is the tub/shower taken over by boxes? Can they sleep in their bed, or is it covered in clothing? Can they walk safely through their home, or are their possessions in the way? People who hoard, have brains that work slightly differently. Their priorities tend to be different, and their rational thinking skills are compromised. People hoard for various reasons. • Most have experienced a tremendous loss, and their coping mechanism tells them that holding onto items is a way to deal with that loss. • They assign value to things which have no actual value and therefore feel it is unwise for them to part with the items. • Their belief that items may be useful someday, which compels them to save more of those items than they could possible ever use. The people who hoard aren’t the ones who typically call Professional Organizers, or anyone for that matter. Most are ashamed of their spaces and don’t want anyone to know about their issues. The sad fact is that help is typically forced on them when others see their homes. 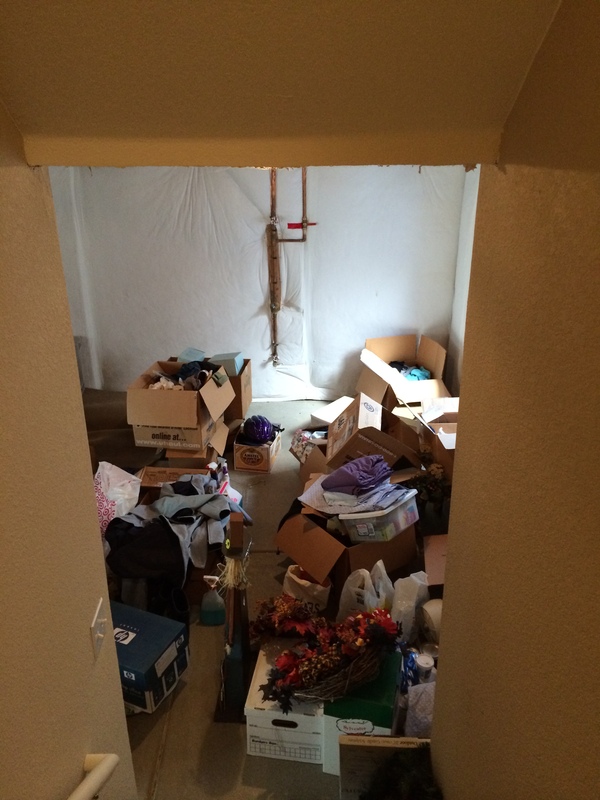 A family member or friend may seek help for a person they believe is hoarding. 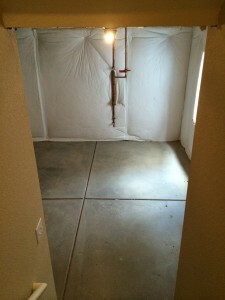 A landlord may require their apartment to be cleaned up in order to continue to stay in the apartment. And, sadly, many homes of people who hoard only get cleared after they have passed away, which is often a direct cause of the hoarding. However, like any chronic disorder, there is no easy fix, and cleaning out the home of a person who hoards, before they are ready to do so, can be damaging to them. It also will most definitely result in a continuation of the hoarding behavior, which will bring them right back to the same place they were before their home was cleared. 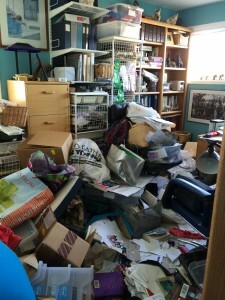 • Hoarding is a psychological disorder that requires assistance from a mental health professional, first and foremost. 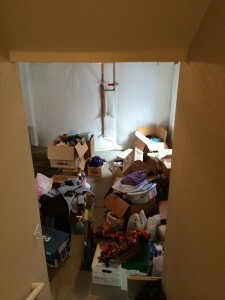 • “Hoarder” is a derogatory term and not a buzz word. • Chances are, you don’t have hoarding tendencies, and you just need a bit of help organizing your clutter. We give gifts for birthdays, anniversaries, engagements, holidays, house-warming’s, births, weddings, showers, baby naming’s, bachelor/bachelorette parties, new jobs, promotions, moving away, graduation, get well, thank you’s, weight loss, sympathy, apology, confirmations, Bar/Bat Mitzvahs, just because, 1st periods, pushing a baby out, 3rd Wednesday of the month, Turtle Day, getting a splinter, getting a splinter out. 1. It’s ok to regift (with care)! If you get gifts you’re not too fond of, or that just aren’t your style, put them directly into a regifting bin. 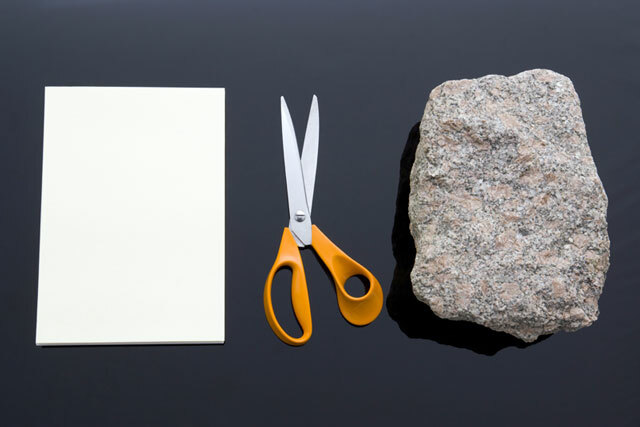 Make sure to attach a sticky note with the name of the gift-giver, so that you don’t give them back their same gift(that would be embarrassing) . Next time you get invited to an event, look through your regifting bin before going to buy something new. 2. It’s ok to donate it! If you’re not comfortable regifting, donating is another great option. This is especially good for those slightly used items that you don’t want anymore, or for hand-me-downs that no longer serve you. Someone else will make good use of your discarded items so you don’t have to feel like they’re going to waste. 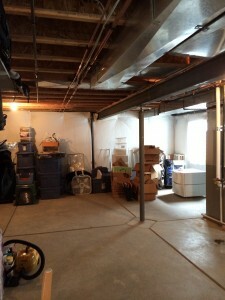 Part of getting your space organized is controlling what comes into the space. While we can’t turn down gifts (that’s just plain rude), we can make ruthless decisions on those gifts without feeling the pangs of guilt. We can also do our part not to contribute to anyone else’s ‘guilt clutter’. Don’t be afraid to get rid of gifts that don’t make you happy! Not every occasion requires a gift! No matter what it is, if it’s free, we want it! Americans are guilty of accepting anything and everything that’s labeled ‘free’. Whether it’s free samples of broccoli casserole at the grocery store (even though we don’t like broccoli), or a free dollop of lotion tucked inside a tiny packet in a magazine (that only covers half of one hand), or a water bottle advertising a mortuary (which I was recently offered), we want it! Most of those freebies end up in the ‘miscellaneous’ drawer, only to be found 3 years later, and thrown away (by your organizer). You know the saying “There’s no such thing as a free lunch”? It means that nothing is ever truly free; there’s always some sort of price to be paid. When accepting free stuff, that you neither want nor need, that price is clutter. Unfortunately, we pay the price when clutter takes over our physical, mental and emotional space. It doesn’t happen overnight, which is why it’s so tricky! Clutter creeps up slowly, and before you know it, your possessions now possess you! I have a question on my assessment form that I always ask potential clients. “How do you hope to feel when everything is organized?” 9 out of 10 times the answer is “Free”. When clients answer this question you can almost see the image of a clutter-free space going though their mind. This image takes the place of the cluttered reality they live with on a daily basis. Ahhh, freedom! What we all yearn for and dream of! The feeling of not being burdened by anything; the feeling of gliding easily through life! I had a client who simply put her mail into boxes when it arived. She had online bill pay, so she didn’t need the paper statements, but she wasn’t sure if she should keep them, and everything else that was sent to her (just in case). She had moved several times, and just had the boxes of mail moved with her. With every move the boxes grew and grew. She was about to move again, and here employer (who was paying for the move), said she needed to decrease the weight of the move. She knew the 30+ boxes of mail, dating back the 1980s were the problem. When I came to work with her, she was adamant about going through each envelope and piece of mail to make sure she wasn’t getting rid of anything important. After doing this for several days, she realized the toll it took on her emotionally and mentally. I was then able to talk her though the notion that if she hasn’t needed any of these papers in the last 3 decades, how important could they really be? I think that gave her the freedom she was looking for and the boxes of mail headed out the door to be shred! Our culture is based on the notion of “he/she with the most stuff wins”. But what do we really win? In the end, the more stuff we have, the less free we tend to feel. So why do we find it so difficult to get rid of our stuff? And why do we acquire more stuff? Don’t accept any more free stuff! The alphabet of organizing! Or, how to simplify your life one letter at a time! We come up with excuses to get out of, or delay, doing things we don’t want to do; excuses for why we’re not as fit or wealthy or organized as we’d like to be. 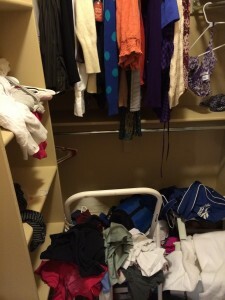 Excuses for not being organized are among the most common “ I don’t have time to put that away.” “ I didn’t put it away because I don’t know where it goes.” “ There’s just way too much to put away.”. Excuses range from being too busy, to not knowing where to start, to feeling overwhelmed. All of these excuses are valid, but they all keep us in a state of limbo, stuck, wanting to make a change, but thinking about all the reasons we can’t, instead. A lot of times we make excuses because we’re not ready to tackle the issue at hand. However, in most cases, the longer we make excuses the bigger the problem grows. If we put off working on a big work/school project until the night before it’s due, we make the project much more difficult and stressful. The same thing goes for organizing projects. If we keep putting papers into a stack, thinking we don’t have the time to file them right now, pretty soon we’ll have several stacks that require hours and hours of time to get them filed. But what if we’ve used so many excuses that we’ve dug a hole we can’t get out of? Get help! Whether it’s hiring a Trainer to get you in shape, a Career Coach to put you on the right track, or a Professional Organizer to declutter your life, it’s never too late to exchange excuses for solutions! The excuses to ‘not’ do something greatly outnumber the reasons ‘to’ do it. But the thing about excuses is that they always keep you from accomplishments. You can have results or excuses, not both! If it’s important to you, you’ll find a way. If not, you’ll find an excuse! If you’re like me, you love when a decision has been made, but you agonize over the making of it! There’s a story my mom likes to tell about me when I was little. She would let me pick out a piece of candy at the checkout of the grocery store and I would proceed to weigh the pros and cons of my potential enjoyment of each piece of candy. So much so that my mom would tell me “you’re not buying a car, just pick a piece of candy so we can go”. Can you imagine how hard it was for me to buy my first car?? So it’s safe to say that I have a bit of difficulty with making decisions! That being said, once I have finally made a decision, it’s like a huge weight has lifted and I never look back and wonder if it’s the right thing to do! Some people are quick decision-makers and some painstakingly slow, like me. However, decisions have to be made in life. That’s just the way it is! Whether they’re small decisions like what to have for dinner or life-altering ones like what job to take, or they lie somewhere in between, like what to do with grandmas stuff once she has passed away, they must be made with care and attention. Not everyone feels this way though. Some people are so paralyzed by decision-making that they simply don’t do it, which leads to all sorts of problems. One of those problems being clutter; clutter is simply delayed decisions. If you’re not sure what to do with the mail when it comes in so you put it in a pile on the kitchen counter, you are delaying the decisions of what needs to be done with it (pay, toss, respond, file, etc). 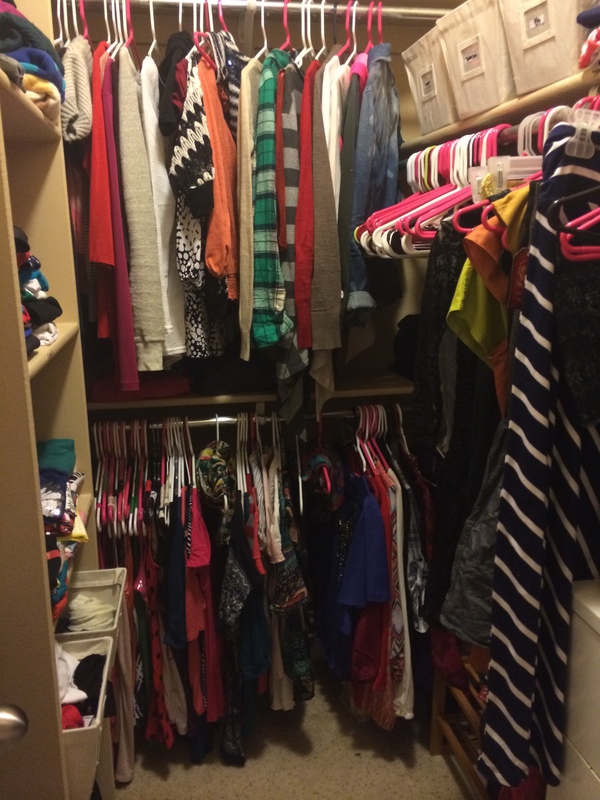 If your closet is packed with stuff you haven’t worn in ages and you don’t know where to put the clean laundry , so you just leave it in the laundry basket, you are delaying cleaning out your closet and deciding what to keep and what to get rid of. There are endless examples of delayed decisions in everything we do. Sometimes deciding tasks become so big and overwhelming that people pretend they don’t exist. But there’s good news! You don’t have to go it alone. If decisions are tough, ask for help! I like to ask for people’s opinions when I have big decisions to make. Often times someone will bring up something I hadn’t thought about which will help sway me one way or another. If things have gotten out of hand and there are just too many decisions to be made, ask for help! This is why my profession exists! We help people make decisions they have trouble making on their own. We come armed with pertinent questions and scenarios that will help jog your decision-making skills. The best part is, that once the decision has been made, there is instant relief! What if I make the wrong decision? You ask. Good question! What constitutes a wrong decision? Getting rid of something and then missing it? If you fear the second thought monster you can always test your decisions out first. Instead for giving your childhood teas set to a charity, try putting it in a box and keeping it out of sight for 6 months. After the 6 months are up evaluate whether you’ve missed it. If not, let it go completely, if you have, find a way to use it (or display it) so it will bring you nostalgic joy. There’s no use keeping joy in a box in your basement! So I bet you’re wondering if my decision-making skills have improved since I’ve become a Professional Organizer. The answer is Yes and NO. I am great at helping others make decisions but I still have trouble picking out a good candy bar (Kit Kats, Butterfinger, Twix…). After all, the fate of dessert is at stake! That one small word can strike fear in the eyes of women, children and well-groomed men! It can also bring on feelings of disgust, exhaustion, overwhelm, anger, sadness and embarrassment for all of us! Clutter has become synonymous with confusion, but at its core, it’s simply a delayed decision! This means that every place in your space where you have clutter lie decisions that have been postponed. Sometimes that’s just because you don’t know where to put something because it doesn’t have a ‘home’, or that you’re too busy to put things into their proper ‘homes’, or sometimes, it goes much deeper than that. For some, decision-making is paralyzing, and the more difficult it is the larger the clutter grows, until it becomes completely overwhelming. This is when we get into issues of hoarding. Don’t get me wrong, I’m not saying that everyone who has difficulty making decisions has hoarding tendencies. If that were true, we would all have therapists on speed-dial! Hoarding is on the extreme side of the clutter spectrum. However, clutter, whether big or small, causes problems if left unchecked. •	Restlessness. With an unsettled space come unsettled emotions — your mind is constantly thinking about everything that needs to be done. •	Lack of Focus. Instead of focusing on the task at hand, you might find yourself weighed down with feelings of guilt about your space. Then your brain becomes overwhelmed trying to process your surroundings. •	Wasted time. Your frustration level soars when you can’t find what you need. •	Wasted Money. When you need something but can’t find it, you end up buying it again, even though you know you have it ‘somewhere’. According to WebMD decreasing clutter and organizing your space leads to better emotional health. When we know what we have and where to find it, we feel more at peace and are able to focus on more important things, like spending time with loved ones, paying bills on time and watching that Love Boat marathon this weekend! What can be better than that?